Shortstop Connor Kaiser’s teammates mob him after he’s hit one of his record tying three home runs during Vandy’s 19-6 rout of Clemson Sunday. Kaiser was Clemson Regional MVP as the Commodores advance in NCAA Tournament. 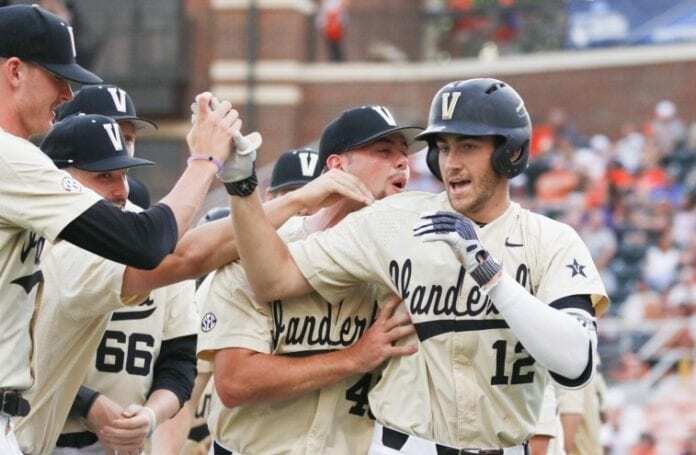 The Vanderbilt Commodores set a school record and tied an NCAA mark for slugging Sunday while battering the Clemson Tigers 19-6 to take the Clemson Regional. The Commodores hit nine home runs, shattering their previous school mark of six, and tying the NCAA single game record. Shortstop Connor Kaiser had a mammoth game, with three home runs (also tying the school record) and knocking in 10 (tying an NCAA tournament record). He’d hit a total of four homers in his previous 163 games. Kaiser was also named the Clemson Regional MVP. Stephen Scott and Philip Clarke each added two more home runs, while Julian Infante and Harrison Ray had single shots. Scott’s two were his 14th and 15th of the season. By the sixth inning, after Kaiser hit a grand slam, the score had ballooned to 11-3. The Clemson pitching staff, in their third game over the last two days and second on Sunday, simply had nothing left, and the Commodores took full advantage. Vanderbilt finished 3-0 in the Regional, but at press time weren’t sure whether they would be at home or on the road later in the week when Super Regional competition begins Friday. The Super Regionals will be best-of-three. Vanderbilt submitted their bid to host a super regional last month. They will meet the winner of the Tallahassee Regional, which would have been either Mississippi State or Oklahoma. The victory also continued their surge since losing the opening game of the SEC Tournament to Texas A&M. In addition to now being in their 13th straight NCAA Tournament, this will be the eighth time the Commodores have reached the Super Regionals, and seventh in the past nine years. The one thing they did know was that they would be in the opening game, whether they play Friday or Saturday, at home or on the road.